...but it's actually very safe! 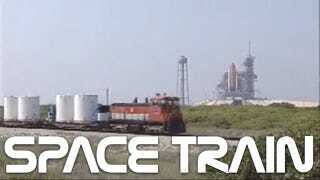 And yes, NASA has a railroad. It's been around since 1963, actually—so apologies to space nuts who've known about it for a while—but only recently has the agency uploaded an expose to YouTube. Seriously, though, this train takes huge, volatile rocket booster segments and fuel from Utah to the Kennedy Space Center on specialized railroad cars, and has been doing so since 1963. It's been upgraded since then, of course, but the goal remains the same: Take those boosters and fuel from where they're processed, refitted, fixed and manufactured, and get them to the launch pad in Florida.